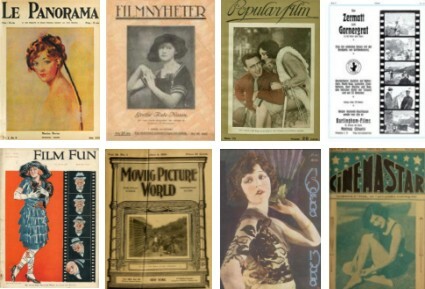 As I think most of you will know, the Bioscope maintains a listing of (hopefully) all of the silent film-era journals that are available online. From just a few titles only a couple of years ago, the number of journals now available – most of them freely so – has grown prodigiously. This is thanks in particular to Gallica in France, Teca Digitale piemontese in Italy, the inspired efforts of the Media History Digital Library, and to the efforts of a number of generous individuals, notably Bruce Long, who have been adding titles from their personal collections to the Internet Archive. All of this activity has made the Bioscope’s listing more than a little unwieldy, certainly too much information for a single web page. So, while keeping the single page listing for handy reference’s sake, we have also produced individual web pages for the journals of specific countries, which we think will be more useful to you. You can find the list by going to ‘Library’ on the top menu of this site. Three sub-page options will appear: Catalogues and Databases, Directories and Journals. Hover over the third of these, and the list of countries will appear. Alternatively, links to all of the countries appear on the main Journals page, or you can click on them here: Austria, Brazil, Canada, France, Germany, Italy, New Zealand, Spain, Sweden, Switzerland, United Kingdom, USA. Inside the U.S. vs. M.P.P.C. volumes, you will find the testimonies of M.P.P.C. members, such as Siegmund Lubin, as well as the testimonies of “Independents” who later became Hollywood moguls (e.g. William Fox). These first-person accounts offer one of the best windows you will find into the workings of the early American film industry. More digitisation from this superb initiative, altruistically funded by individual Domitor members, can be expected in the near future.